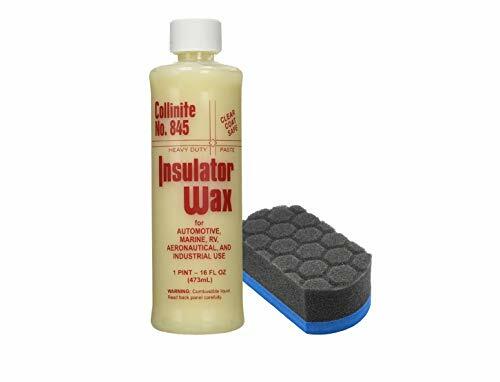 This heavy duty liquid wax was originally developed for use by electric power companies for protection against high voltage power failure, fires and explosions. It’s primary use is on the finishes of automobiles, trucks, buses, boats, personal water craft, and airplanes where durability, high gloss and lasting protection are paramount. An excellent choice for fleet applications and very easy to use–requires minimum rubbing or buffing. Clear coat safe. Also known as #925 Fiberglass Boat Wax which is described as follows: Goes on easy and stays on all season for a wipe and shine deck, glistening topsides, and a super slippery bottom. Contains a special pure Carnauba wax formula proven in harsh industrial environments. It will easily shrug off scrubbing, scuffing, detergents, salt water and marine organisms. Recommended by Strataglass™. The longest lasting wax we carry! For Marine & Aeronautical Finishes. Developed especially to seal and shield against acid rain, sun, salt spray, bugs and other environmental acids. Easily applied and non-abrasive, wax will prevent finish deterioration and the adhesion of foreign elements. Clear coat safe.